PRADAS BOOK GROUP (A Group for Adults Reading Teen Novels) Open to the Community Wednesday, August 21 at 6:30 p.m. Lisa N. will be discussing Barry Lyga's novel I Hunt Killers. Barry Lyga will sign and discuss Game (Little Brown for Young Readers; $17.99), the follow up to I Hunt Killers (Little Brown for Young Readers; $8.99). After graduating from Yale with a degree in English, Barry Lyga worked in the comic book industry for ten years. In 2006, his first young adult novel, The Astonishing Adventures of Fanboy and Goth Girl, was published to rave reviews, including starred reviews from Booklist and School Library Journal. USA Today called it “an entertaining read no matter what age you are.” VOYA commented, “A triumphant finale leaves readers wanting to read the novel again and again.” SLJ listed the book as one of the best of 2006. His second young adult novel, Boy Toy, received starred reviews in SLJ, Publishers Weekly, and Kirkus. VOYA gave it its highest critical rating, and the Chicago Tribune called it "...an astounding portrayal of what it is like to be the young male victim." His third novel, Hero-Type, hit stores in Fall 2008 and, according to VOYA "proves that there are still fresh ideas and new, interesting story lines to be explored in young adult literature." Since then, he has also written Goth Girl Rising (the sequel to his first novel), as well as the Archvillain series for middle-grade readers and the graphic novel Mangaman (with art by Colleen Doran). His upcoming books include more Archvillain and the YA series I Hunt Killers. Publisher’s Weekly named Lyga a “Flying Start” in December 2006 on the strength of his debut. Lyga lives and writes in the big city. His comic book collection is a lot smaller than it used to be, but is still way too big. 7PM FRIDAY, MAY 25 Teen Event | Barry Lyga: I Hunt Killers and Lisa McMann: Dead To You Barry Lyga Lisa McMann Bestselling teen authors Barry Lyga and Lisa McMann visit to discuss their newest novels. ﻿In Lyga's I Hunt Killers, Jazz seems like a likeable teenager. But he's also the son of an infamous serial killer and has witnessed crime scenes the way cops wish they could—from the criminal's point of view. Now that bodies are piling up in Lobo's Nod, Jazz joins the police in a hunt for a new serial killer in an effort to clear his name. In McMann's Dead To You, Ethan was abducted when he was just seven- years-old. Now, at sixteen, he has returned to his family. It's a miracle, until the tensions start to build. If only Ethan could remember something, anything, about his life before, he'd be able to put the pieces back together. But there's something that's keeping his memory blocked—something unspeakable. After graduating from Yale with a degree in English, Barry Lyga worked in the comic book industry for ten years. In 2006, his first young adult novel, The Astonishing Adventures of Fanboy and Goth Girl, was published to rave reviews, including starred reviews from Booklist and School Library Journal. USA Today called it “an entertaining read no matter what age you are.” VOYA commented, “A triumphant finale leaves readers wanting to read the novel again and again.” SLJ listed the book as one of the best of 2006. His second young adult novel, Boy Toy, received starred reviews in SLJ, Publishers Weekly, and Kirkus. VOYA gave it its highest critical rating, and the Chicago Tribune called it "...an astounding portrayal of what it is like to be the young male victim." His third novel, Hero-Type, hit stores in Fall 2008 and, according to VOYA "proves that there are still fresh ideas and new, interesting story lines to be explored in young adult literature." His upcoming books include more Archvillain and the YA series I Hunt Killers. Publisher’s Weekly named Lyga a “Flying Start” in December 2006 on the strength of his debut. Lyga lives and writes in the big city. His comic book collection is a lot smaller than it used to be, but is still way too big. 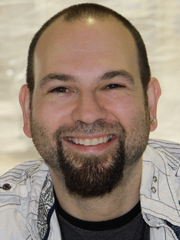 Yale graduate Barry Lyga spent ten years working for Diamond Comic Distribution. Lyga was an instrumental player in the development of Diamond's contributions to the now-annual Free Comic Book Day. During his stint with DCD, the self-proclaimed recovering comic book geek began publishing short stories, and soon advanced into his first love – novels. In his first novel, The Astonishing Adventures of Fanboy and Goth Girl, Lyga based Fanboy on his own experiences. I Hunt Killers, Lyga's eighth YA novel, tells the story of Jazz, the son of the world's most infamous serial killer. We're hoping this one isn't based on Lyga's experiences. We will be raffling off I Hunt Killer T-shirts, and at the event readers will also be able to enter in a drawing to win an I-Touch loaded with an exclusive preview of I Hunt Killers. Barry Lyga, Archvillain. ; A. LaFaye, The Keening. ; Neal Shusterman, Bruiser. Barry Lyga is currently considered a "single author." If one or more works are by a distinct, homonymous authors, go ahead and split the author. Barry Lyga is composed of 2 names. You can examine and separate out names.